An ancient mutant named En Sabah Nur (Oscar Isaac), who perceives himself as a god, has been buried under and Egyptian temple for thousands of years. He wakes up in the 1980's and goes on a search for the most powerful mutants to imbue with power. These are his Four Horsemen: Magneto (Michael Fassbender), Angel (Ben Hardy), Storm (Alexandra Shipp), and Psylocke (Olivia Munn); he wants these devotees to help him destroy the world so he can start it new. 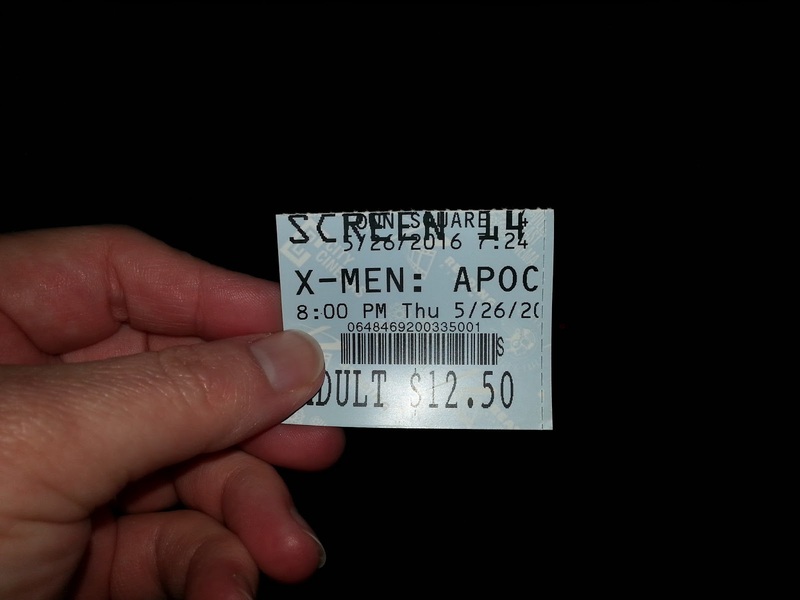 With mankind rendered helpless, the X-Men join forces to stop the impending apocalypse. 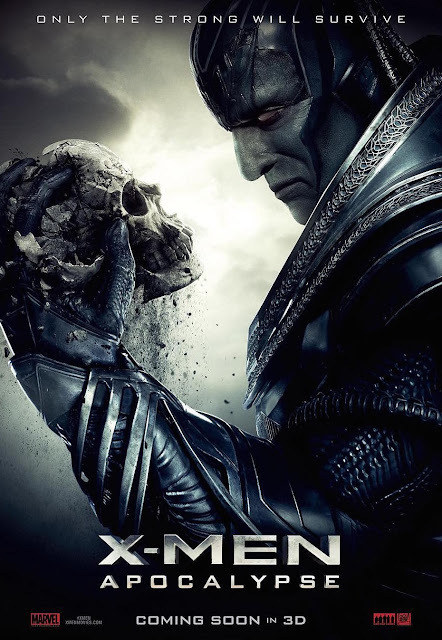 "X-Men: Apocalypse" is the third film in the "X-Men: First Class" series, the sixth overall X-Men film, and the ninth to take place in the X-Men universe. Savvy? This is the fourth from this universe to be directed by Bryan Singer, and he has certainly moved this installment into some very dark themes and territories. This film boasts a massive cast. Many actors reprise their roles from the previous films in this universe, and a host of newcomers fill out both new to the series roles and those that have been previously played by other actors from the old series timeline. Keeping up with all this timeline stuff? Returning are James McAvoy as Professor X, Michael Fassbender as Magneto, Jennifer Lawrence as Mystique, Nicholas Hoult as Beast, Rose Byrne as Moira Mactaggert, Evan Peters as Quicksilver/Peter Maximoff, Josh Helman as Stryker, and Lucas Till as Havoc. New to the cast are Oscar Isaac as En Sabah Nur/Apocalypse, Sophie Turner as Jean Grey, Tye Sheridan as Cyclops, Kodi Smit-McPhee as Nightcrawler, Ben Hardy as Angel, Alexandra Shipp as Storm, and Olivia Munn as Psylocke. Say this 5 times fast. 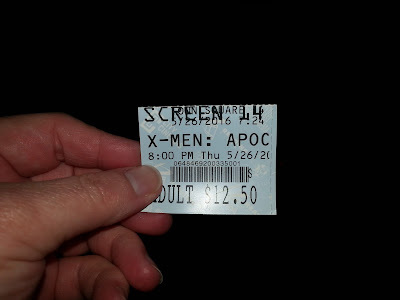 All of these characters, with the exception of Apocalypse, have appeared in a previous X-Men film, only portrayed by different actors. Not only is this a massive cast, but it includes a ton of damn fine actors, many of which give very good performances. Not all performances are created equal, but more on this later. There are a lot of things to love about "X-Men: Apocalypse." The standout performance in this movie is the titular mutant himself. Oscar Isaac, who is fantastic in everything, finds a way to sift through the movie's few flaws and deliver what we feel is a worthy performance. With a menacing voice, he is able to captivate others into following him to destroy the world. Other critics have mentioned not liking Isaac's performance, that his essence is stripped down and many of his good qualities are taken away, only to be hidden behind blueberry colored body paint. We disagree. Apocalypse might not be physically intimidating, but his words are enough to build armies, even if these words are essentially multiple versions of the same sentence. Of course, Isaac cannot change what the script contains, but he sure as hell gives it his all. James McAvoy and Michael Fassbender, once again, remain flawless casting choices for Professor X and Magneto. They really amp up the feels when it comes to Magneto reacquainting himself with his powers. There is a very heart-wrenching scene in the film that nearly made us cry, and Fassbender pulls it off with stellar emotions. Can't Magneto ever catch a break McAvoy's Professor X assumes a bit of a different role this time around, but he plays it so picture perfectly that we would watch an entire Professor X movie on its own. Their relationship, even when strained, makes for good on-screen chemistry and drama. Quicksilver, played once again by Evan Peters, absolutely steals the show. His use in such a dark film like this is just what the audience needs to take a comedic break from all the destruction. Between the quick-witted quips and the CGI-assisted visual gags, Peters is the perfect choice for this role, and his scene here rivals the one he had in "Days of Future Past." Kodi-Smit McPhee also proves he is an excellent casting choice for Nightcrawler and he plays the part with charisma, pride, and conviction. Tye Sheridan, who we have really come to love from movies like "Mud" and "Joe," is another example of expert casting. His Scott Summers/Cyclops mirrors that of the performance James Marsden gave many years ago. It will be interesting to see where any future films take his character. There is one scene and character that the second trailer for this movie spoiled, so we won't talk about it in detail here in case you haven't seen it, but just know, this scene is amazing. Another welcome addition amongst the darkness. Now, for the bad. We love the character of Jean Grey, but we feel Sophie Turner is a little too dry for such a pivotal character. There is one scene towards the end that doesn't require Turner to say anything, which is the best scene featuring her character. Nearly all of the other Horsemen, apart from Magneto, are underutilized and underdeveloped. Olivia Munn's Psylocke might look like she's came straight from the comic books, but to us, she looked more like a cheap version of Psylocke cosplay. We can see the headline now: "sword-armed stripper invades Auschwitz." Storm, played by Alexandra Shipp, and Angel, played by Ben Hardy, serve very little purpose, though we like Storm's overall character resolution and wouldn't mind seeing Shipp play her again in a future film. Shipp is able to keep her African accent, unlike Halle Berry from the original timeline, who dropped it by the wayside mid-movie. As much as we like Jennifer Lawrence, we are getting a little tired of how they utilize her as Mystique. Like a lot of other fans and critics, we now think she is being overused in this series. Lawrence feels like she's phoning it in this time around. It's almost like she knew she was contractually obligated for three films, so she doesn't offer up her best possible performance and it certainly shows. Plus, and this may have been a studio decision to bank upon her name and face, but Mystique spends too much time on screen out of her blue makeup. Compare this to Rebecca Romijn from the original movies, who was rarely if ever out of costume...and she was a Victoria Secret model. "X-Men: Apocalypse" does offer up a visual spectacle that can delight your senses, though there are a couple of instances where the CGI looks hokey. There is some fun action here, as well as some tragic, deeply emotional moments. Unfortunately, there are also times where the movie feels pretty slow because there are so many characters and there is so much to put into the film, it takes a while to process what is happening before it finally settles in and gets going. The one thing "X-Men: Apocalypse" does well is, unlike other recent films, it balances light and dark themes. It can go from being deeply emotionally moving and sometime extremely violent to a joking, fun time and it rarely if ever feels out of place. In the end, this is a solid addition to the X-Men universe, not the best film in the series, but certainly not the worst. One year ago, we were watching: "Mad Max: Beyond Thunderdome"